Arsenal only have one England reserve going to the World Cup – who cares? There were great hopes that Arsenal’s much-lauded ‘English Core’ were going to be the future of England as well as the Gunners, but that quickly fell by the wayside and not one of them ever became a regular in the national side, in fact they hardly excelled at Arsenal either. So today we find out that the only Arsenal player going to Russia this summer is our much-injured striker Danny Welbeck, and the chances of him getting a game ahead of Kane, Vardy and Rashford is pretty much slim to say the least. And Welbeck wasn’t even one of Wenger’s Golden generation of British lads as he was brought in from Man United after he had already made appearances for the national side. Oh well here is the full England squad, if anyone is interested…. This entry was posted in Arsenal News, Arsenal NewsNow on May 17, 2018 by Admin. ‘Welbeck fully deserved the call.’ Hahaha – hilarious! Spending a lot of energy running around like a headless chicken with no end product is not ‘giving a good contribution in big games.’ Always surprised when Welbeck makes the Arsenal squad, let alone England’s. Hope the new manager/coach or whatever he’s going to be called can ship him out quickly along with fellow deadwoods Iwobi, Elneny and Xhaka. Sorry, but Jack do not deserve it at all. Wellbeck works hard and can start from the wings very utility player. I think he will play for sure some matches. I’m surprised Wilshere didn’t make the cut, not completely but a little bit yeah. One of England’s problems is a lack of technical ability in midfield, the bigger nations dominate England in that area. England are too direct to be a real threat against teams who know how to move a ball, even some smaller nations play better than England but they just don’t have enough fire power/quality finishers. 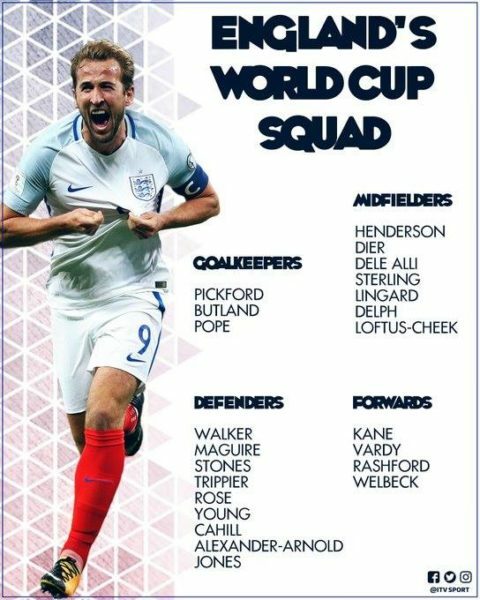 Assuming England plays 4-4-2 to accomodate both Kane and Vardy, there will be only 2 slots in midfield with Sterling/Lingaard or Rashford/Welbeck on either wing. So midfield will obviously go to Eric Dier and Dele Alli. If a sub for a midfielder would have needed to be made it will be Henderson so it would have been a waste of time picking Wilshere. He would have never played as he is not as good as Dele Alli in attack or Eric Dier in defense and Henderson is above him on the pecking order. The lack of Arsenal players in the England squad is a sad reflection on our departed Manager who failed to bring on the “English core”.As far as I can see AMN is the only Arsenal player who will become a regular in the England team. Yes, blame Wenger for everything including laziness of players as well. Wenger’s only fault was believing in the potential of the British core in their youth and gave them the best platform to perform by playing them regularly and not buying established players in their positions so as not to stifle their growth. All of them except Ramsey became complacent and stopped working hard to improve. Ramsey on the other hand continued to work hard and is presently captain of the Welsh team and will walk into the English lineup had he been English! Not all became complacent. wilshere, ramsey and ox are injury-prone and need to their minutes managed and jenkinson, gibbs were just not good enough. Only jack was technically good enough while rambo and ox depended on their physical ability(increasing risk of injuries) and jack was ruined by injuries as he missed years off his development. It was a desperate attempt by wenger as his previous super talented core of fabregas, nasri and van persie has left arsenal instead of sticking by him and us. He thought an english core would be more loyal which they were but far behind talent-wise. Welbeck did well in the europa league. But Arsene did not trust him enough against Atletico. Hahaha , I wonder whether England will go far with their static midfield, no creative player…..